The Academy Award nominations can drive you crazy between the snubs and the needless accolades. Some years are so bad, you may think you’ll never forgive them. But every year, however misguided their big ticket nominations, the academy does at least one wonderful thing. They draw attention to short films that would otherwise go unnoticed. Do yourself a favor and head to the Gateway Film Center to catch all fifteen of these magnificent short subject works of art, starting with five brilliant and varied animated features. The nominations this year net a variety of styles and tones. The clear frontrunner for the Oscar is Disney’s Get a Horse, the 3-D short that accompanied their popular (and prescient!) Frozen. 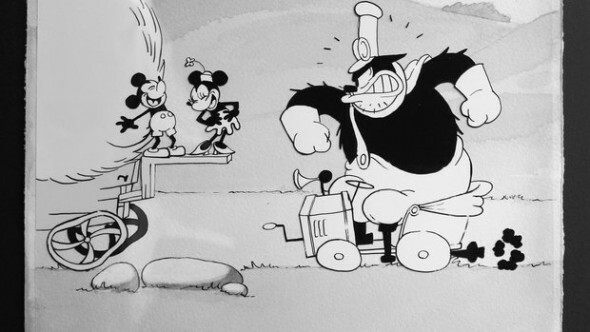 Director Lauren MacMullen’s six minute ‘toon is a joyous ode to animation history, bridging Disney’s past with its future by mixing archival Mickey Mouse animation with modern cinematic storytelling. At the other end of the spectrum is Ferel, a shadowy, impressionistic tale of a wild boy found by a hunter and introduced to society. Smokey images in shades of grey underscore the story’s haunting nature. Equally haunted, though in a more literal and offbeat manner, is Shuhei Morita’s Possessions. A fix-it man travels, wares on his back, through a terrible storm. He takes shelter in an abandoned shack to witness the discarded items there come to life. It’s a lively, entertaining piece on a consume-and-discard culture. Room on the Broom is a longer, stop-action style film aimed at a younger crowd. Simon Pegg voices the narration for the tale of a good hearted witch who never met a new friend she didn’t want to make, regardless of her cat’s preferences. It’s a sweet image of acceptance and family. The best of the bunch, though likely not to be the winner, is the appealing Mr. Hublot. In a clattery, mechanical future world, idiosyncratic Mr. Hublot lives alone with his OCD. His days are full – straightening picture frames, turning the lights on and off, on and off, on and off. Back to straightening frames – though he can’t help but hear that abandoned, barking puppy out there in the weather. Writer Laurent Witz, along with his co-director Alexandre Espigares, creates an endearing image of familial love and acceptance with this charmer. Every one’s a winner regardless of the final vote. Catch them while you can.